We will now review very briefly the main phases of the world struggle, which had thus commenced. Planned by Germany, it began with a swift attack designed to «knock out» France while Russia was still getting her forces together in the East. For a time all went well. Military science is never up to date under modern conditions, because military men are as a class unimaginative, there always at any date undeveloped inventions capable of disturbing current tactical and strategic practice which the military intelligence has declined. The German plan had been made for some years; it was a stale plan; it could probably have been foiled at the outset by a proper use of entrenchments and barbed wire and machine guns, but the French were by no means as advanced in their military science as the Germans, and they trusted to methods of open warfare that were at least fourteen years behind the times. They had proper equipment neither of barbed wire nor machine guns, and there was a ridiculous tradition that the Frenchman did not fight well behind earthworks. The Belgian frontier was defended by the fortress of Liège, ten or twelve years out of date, with forts whose armament had been furnished and fitted in many cases by German contractors; and the French north-eastern frontier was very badly equipped. Naturally the German armament firm of Krupp had provided nutcrackers for these nuts, in the form of exceptionally heavy guns firing high explosive shell. These defences proved therefore to be mere traps for their garrisons. The French attacked and failed in the southern Ardennes. The German hosts swung round the French left with an effect of being irresistible; Liege fell on August 9th, Brussels was reached on August 20th, and the small British army of about 70,000, which had arrived in Belgium, was struck at Mons (August 22nd) in overwhelming force, and driven backward in spite of the very deadly rifle tactics it had learnt during the South African War. The little British force was pushed aside westward, and the German right swept down so as to leave Paris to the west and crumple the entire French army back upon it’s self. So confident was the German higher command at this stage of having won the war, that by the end of August German troops were already being withdrawn for the Eastern front, where the Russians were playing havoc in East and West Prussia. And thou came the French counter-attack, strategically a very swift and brilliant counter-attack. The French struck back on their center, they produced an unexpected army on their left, and the small British army, shaken but reinforced, was still fit to play a worthy part in the counter-stroke. The German right overran itself, lost its cohesion, and was driven back from the Marne to the Aisne (Battle of the Marne, September 6th to loth). It would have been driven back farther had it not had the art of entrenchment in reserve. Upon the Aisne it stood and dug itself in. The heavy guns, the high explosive shell, the tanks, needed by the allies to smash up these entrenchments, did not yet exist. 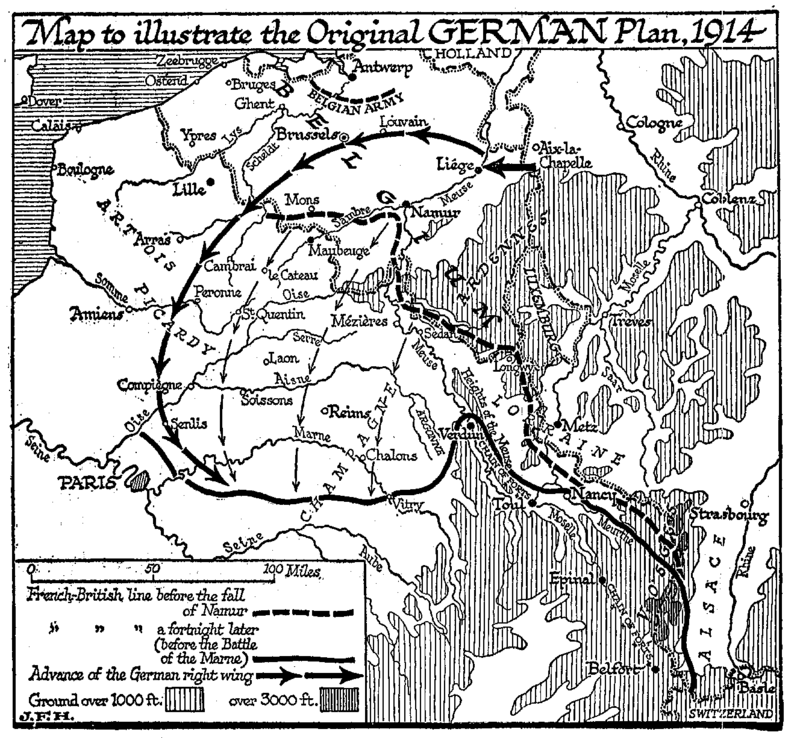 The Battle of the Marne shattered the original German plan. For a time France was saved. But the German was not defeated; he had still a great offensive superiority in men and equipment. His fear of the Russian in the east had been relieved by a tremendous victory at Tannenberg. His next phase was a headlong, less elaborately planned campaign to outflank the left of the allied armies and to seize the Channel ports and cut off supplies coming from Britain to France. Both armies extended to the west in a sort of race to the coast. Then the Germans, with a great superiority of guns and equipment, struck at the British round and about Ypres. They came very near to a break through, but the British held them. The war on the Western front settled down to trench warfare. Neither side had the science and equipment needed to solve the problem of breaking through modern entrenchments and entanglements, and both sides were now compelled to resort to scientific men, inventors, and such-like unmilitary persons for counsel and help in their difficulty. At that time the essential problem of trench warfare had already been solved; there existed in England, for instance, the model of a tank, which would have given the allies a swift and easy victory before 1916; but the professional military mind is by necessity an inferior and unimaginative mind; no man of high intellectual quality would willingly imprison his gifts in such a calling; nearly all supremely great soldiers have been either inexperienced fresh-minded young men like Alexander, Napoleon, and Hoche, politicians turned soldiers like Julius Cæsar, nomads like the Hun and Mongol captains, or amateurs like Cromwell and Washington; whereas this war after fifty years of militarism was a hopelessly professional war; from first to last it was impossible to get it out of the hands of the regular generals, and neither the German nor allied headquarters was disposed to regard an invention with toleration that would destroy their traditional methods. The tank was not only disagreeably strange to these military gentlemen, but it gave an unprofessional protection to the common soldiers within it. The Germans, however, did make some innovations. In February (28) they produced a ratber futile novelty, the flame projector, the user of which was in constant danger of being burnt alive, and in April, in the midst of a second great offensive upon the British (second Battle of Ypres, April 17th to May 17th), they employed a cloud of poison gas. This horrible device was used against Algerian and Canadian troops; it shook them by the physical torture it inflicted, and by the anguish of those who died, but it failed to break through them. For some weeks chemists were of more importance than soldiers on the allied front, and within six weeks the defensive troops were already in possession of protective methods and devices. 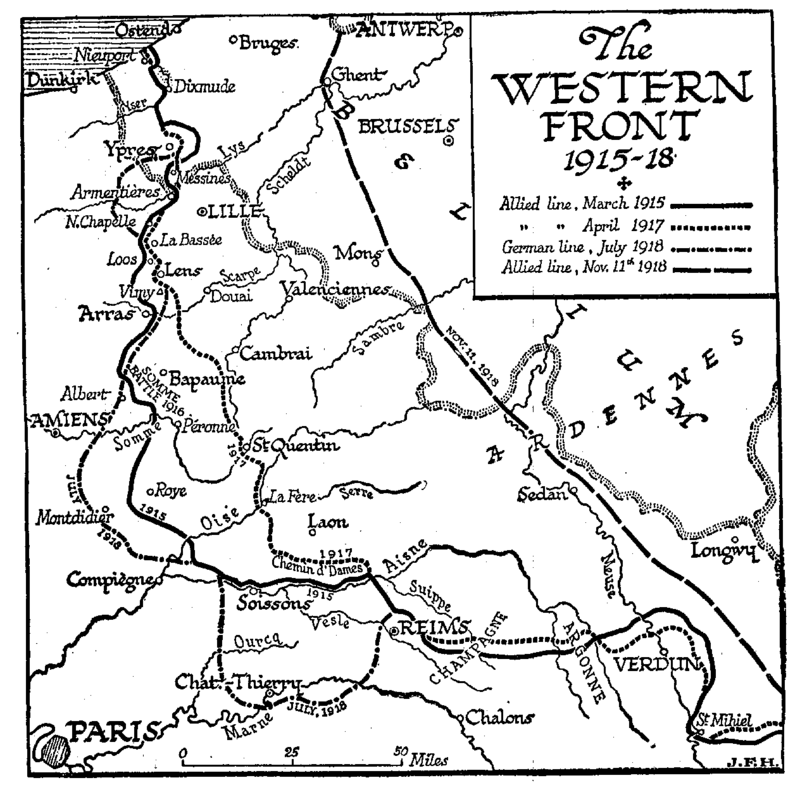 For a year and a half, until July 1916, the Western front remained in a state of indecisive tension. There were heavy attacks on either side that ended in bloody repulses. The French made costly but glorious thrusts at Arras and in Champagne in 1915, the British at Loos. &gt;From Switzerland to the North Sea there ran two continuous lines of entrenchment, sometimes at a distance of it mile or more, sometimes at a distance of a few feet (at Arras e.g. ), and in and behind these lines of trenches millions of men toiled, raided their enemies, and prepared for sanguinary and foredoomed offensives. In any preceding age these stagnant masses of men would have engendered a pestilence inevitably, but here again modern science had altered the conditions of warfare. Certain novel diseases appeared, trench feet for instance, caused by prolonged standing in cold water, new forms of dysentery, and the like, but none developed to an extent to disable either combatant force. Behind this front the whole life of the belligerent nations was being turned more and more to the task of maintaining supplies of food, munitions, and, above all, men to supply the places of those who day by day were killed or mangled. The Germans had had the luck to possess a considerable number of big siege guns intended for the frontier fortresses; these were now available for trench smashing with high explosive, a use no one had foreseen for them. The Allies throughout the first years were markedly inferior in their supply of big guns and ammunition, and their losses were steadily greater than the German. Mr. Asquith, the British Prime Minister, though a very fine practitioner in all the arts of Parliament, was wanting in creative ability; and it is probably due to the push and hustle of Mr. Lloyd George (who, presently ousted him in December, 1916) and the clamor of the British press that this inferiority of supplies was eventually rectified. There was a tremendous German onslaught upon the French throughout the first half of 1916 round and about Verdun. The Germans suffered enormous losses and were held, after pushing in the French lines for some miles. The French losses were as great or greater. « Ils ne passeront pas», said and sang the French infantry and kept their word. The Eastern German front was more extended and less systematically entrenched than the Western. For a time the Russian armies continued to press westward in spite of the Tannenberg disaster. They conquered nearly the whole of Galicia from the Austrians, took Lemberg on September 2nd, 1914, and the great fortress of Przemysl on March 22nd, 1915. But after the Germans had failed to break the Western front of the Allies, and after an ineffective Allied offensive made without proper material, they turned to Russia, and a series of heavy blows, with a novel use of massed artillery, were struck first in the south and then at the north of the Russian front. On June 22nd, Przemysl was retaken, and the whole Russian line was driven back until Vilna (September 2nd) was in German hands. In May 1915 (23rd), Italy joined the allies, and declared war upon Austria. (Not until a year later did she declare war on Germany.) She pushed over her eastern boundary towards Goritzia (which fell in the summer of 1916), but her intervention was of little use at that time to either Russia or the two Western powers. She merely established another line of trench warfare among the high mountains of her picturesque northeastern frontier. While the main fronts of the chief combatants were in this state of exhaustive deadlock, both sides were attempting to strike round behind the front of their adversaries. The Germans made a series of Zeppelin, and later of aeroplane raids upon Paris and the east of England. Ostensibly these aimed at depots, ammunition works, and the like targets of military importance but practically they bombed promiscuously at inhabited places. At first these raiders dropped not very effective bombs, but later the size and quality of these missiles increased, considerable numbers of people were killed and injured, and very much damage was done. The English people were roused to a pitch of extreme indignation by these outrages. Although the Germans had possessed Zeppelins for some years, no one in authority in Great Britain had thought out the proper methods of dealing with them, and it was not until late in 1916 that an adequate supply of anti-aircraft guns was brought into play and, that these raiders were systematically attacked by aero planes. Then came a series of Zeppelin disasters, and after the spring of 1917 they ceased to be used for any purpose but sea scouting, and, their place as raiders was taken by large aero planes (the Gothas). The visits of these latter machines to London and the east of England became systematic after the summer of 1917. All through the winter of 1917-18, London on every moonlight night became familiar with the banging of warning maroons, the shrill whistles of the police alarm, the hasty clearance of the streets, the distant rumbling of scores and hundreds of anti-aircraft guns growing steadily to a wild, uproar of thuds and crashes, the swish of flying shrapnel, and at last, if any of the raiders got through the barrage, with the dull heavy bang of the bursting bombs. Then presently, amidst the diminuendo of the gunfire would come the inimitable rushing sound of the fire brigade engines and the hurry of the ambulances. War was brought home to every Londoner by these experiences. While the Germans were thus assailing the nerve of their enemy home population through the air, they were also attacking the overseas trade of the British by every means in their power. At the outset of the war they had various trade destroyers scattered over the world, and a squadron of powerful modern cruisers in the Pacific, namely, the Scharnhorst, the Gneisenau, the Leipzig, the Nurnberg, and the Dresden. Some of the detached cruisers, and particularly the Emden, did a considerable amount of commerce destroying before they were hunted down, and the main squadron caught an inferior British-force off the coast of Chile and sank the Good Hope and the Monmouth on November 1st, 1914. A month later German ships were pounced upon by a British force and all (except the Dresden) sunk by Admiral Sturdee in the Battle of the Falkland Isles. After this conflict the allies remained in undisputed possession of the surface of the sea, a supremacy, which the great naval Battle of Jutland (May 1st, 1916) did nothing to shake. The Germans concentrated their attention more and more upon submarine warfare. From the beginning of the war they had had considerable submarine successes. On one day, September 22nd, 1914, they sank three powerful cruisers, the Aboukir, the Hogue, and the Cressy, with 1,473 men. They continued to levy a toll upon British shipping throughout the war; at first they hailed and examined passenger and mercantile shipping, but this practice they discontinued for fear of traps, and in the spring of 1915 they began to sink ships without notice. In May 1915, they sank the great passenger liner, the Lusitania, without any warning, drowning a number of American citizens. This embittered American feeling against them, but the possibility of injuring and perhaps reducing Britain by a submarine blockade was so great, that they persisted in a more and more intensified submarine campaign, regardless of the danger of dragging the United States into the circle of their enemies. Meanwhile, Turkish forces, very ill-equipped, were making threatening gestures at Egypt across the desert of Sinai. And while the Germans were thus striking at Britain, their least accessible and most formidable antagonist, through the air and under the sea, the French and British were also embarking upon a disastrous flank attack in the east upon the Central Powers through Turkey. The Gallipoli campaign was finely imagined, but disgracefully executed. Had it succeeded, the Allies would have captured Constantinople in 1915. But the Turks were given two months’ notice of the project by a premature bombardment of the Dardanelles in February, the scheme was also probably betrayed through the Greek Court, and when at last British and French forces were landed upon the Gallipoli peninsula in April, they found the Turks well entrenched and better equipped for trench warfare than themselves. The Allies trusted for heavy artillery to the great guns of the ships, which were comparatively useless for battering down entrenchments, and among every other sort of thing that they had failed to foresee, they had not foreseen hostile submarines. Several great battleships were lost; they went down in the same clear waters over which the ships of Xerxes had once sailed to their fate at Salamis. The story of the Gallipoli campaign from the side of the Allies is at once heroic and pitiful, a story of courage and incompetence, and of life, material, and prestige wasted, culminating in a withdrawal in January, 1916. Linked up closely with the vacillation of Greece was the entry of Bulgaria into the war (October 12th, 1915). The king of Bulgaria had hesitated for more than a year to make any decision between the two sides. Now the manifest failure of the British at Gallipoli, coupled with a strong Austro-German attack in Serbia, swung him over to the Central Powers. While the Serbs were hotly engaged with the Austro-German invaders upon the Danube he attacked Serbia in the rear, and in a few weeks the country had been completely overrun. The Serbian army made a terrible retreat through the mountains of Albania to the coast, where it’s remains were rescued by an Allied fleet. An Allied force landed at Salonika in Greece, and pushed inland towards Mouastir, but was unable to render any effectual assistance to the Serbians. It was the Salonika plan which sealed the fate of the Gallipoli expedition. To the east, in Mesopotamia, the British, using «Indian troops chiefly, made a still remoter flank attack upon the Central Powers. An army, very ill provided for the campaign, was landed at Basra in the November of 1914, and pushed up towards Bagdad in the following year. It gained a victory at Ctesiphon, the ancient Arsacid and Sassanid capital within twenty-five miles of Bagdad, but the Turks were heavily reinforced, there was a retreat to Kut, and there the British army, under General Townshend, was surrounded and starved into surrender on April 29th, 1916. All these campaigns in the air, under the seas, in Russia, Turkey, and Asia, were subsidiary to the main front, the front of decision, between Switzerland and the sea; and there the main millions lay entrenched, slowly learning the necessary methods of modern scientific warfare. There was a rapid progress in the use of the aeroplane. At the outset of the war aeroplanes had been used chiefly for scouting, and by the Germans for the dropping of marks for the artillery. Such a thing as aerial fighting was unheard of. In 1916 the aeroplanes carried machine guns and fought in the air; their bombing work was increasingly important, they had developed a wonderful art of aerial photography, and all the aerial side of artillery work, both with aeroplanes and observation balloons, had been enormously developed. But the military mind was still resisting the use of the tank, the obvious weapon for decision in trench warfare. Many intelligent people outside military circles understood this quite clearly. The use of the tank against trenches was an altogether obvious expedient. Leonardo da Vinci invented an early tank, but what military «expert» has ever had the wits to study Leonardo? Soon after the South African War, in 1903, there were stories in magazines describing imaginary battles in which tanks figured, and a complete working model of a tank made by Mr. J. A. Corry of Leeds, was shown to the British military authorities that of course rejected it in 1911. Tanks had been invented and re-invented before the war began. But had the matter rested entirely in the hands of the military, there would never have been any use of tanks. It was Mr. Winston Churchill, who was at the British Admiralty in 1915-16, who insisted upon the manufacture of the first tanks, and it was in the teeth of the grimmest opposition that they were sent to France. To the British navy, and not to the army, military science owes the use of these devices. The German military authorities were equally set against them. In July, 1916, Sir Douglas Haig, the British commander-in-chief, began a great offensive, which failed to break through the German, line. In some places he advanced a few miles; in others he was completely defeated. There was a huge slaughter of the new British armies. And he did not use tanks. In September, when the season was growing too late for a sustained offensive, tanks first appeared in warfare. A few were put into action by the British in a not very intelligent fashion. Their effect upon the German was profound, they produced something like a panic, and there can be little doubt that had they been used in July in sufficient numbers and handled by a general of imagination and energy, they would have ended the war there and then. At that time the Allies were in greater strength than the Germans upon the Western front. The odds were roughly seven to four. Russia, though fast approaching exhaustion, was still fighting, Italy was pressing the Austrians hard, and Rumania was just entering the war on the side of the Allies. But the waste of men in this disastrous July offensive, and the incompetence of the British military command, brought the Allied cause to the very brink of disaster. Directly the British failure of July had reassured the Germans, they turned on the Rumanians, and the winter of 1916 saw the same fate overtake Rumania that had fallen upon Serbia in 1915. The year that, had begun with the retreat from Gallipoli and the surrender of Kut, ended with the crushing of Rumania and with volleys fired at a landing party of French and British marines by a royalist crowd in the port of Athens. It looked as though King Constantine of Greece meant to lead his people in the footsteps of King Ferdinand of Bulgaria. But the coastline of Greece is one much exposed to naval action. Greece was blockaded, and a French force from Salonika joined hands with an Italian force from Valona to cut the king of Greece off from his Central European friends. On the whole, things looked much less dangerous for the Hohenzollern imperialism at the end of 1916 than they had done after the failure of the first great rush at the Marne. The Allies had wasted two years of opportunity. Belgium, Serbia, and Rumania, and large areas of France and Russia, were occupied by Austro-German troops. Counterstroke after counterstroke had failed, and Russia was now tottering towards a collapse. Had Germany been ruled with any wisdom, she might have made a reasonable peace at this time. But the touch of success had intoxicated her imperialists. They wanted not safety, but triumph, not world welfare, but world empire. «World power or downfall» was their formula; it gave their antagonists no alternative but a fight to a conclusive end.